The diabetes community needs champions like the Diabetes Technology Society, who held an important meeting in Bethesda, Maryland on September 9, 2013 titled: “Verifying the Performance of Blood Glucose Monitors Following FDA Clearance”. The DTS has announced they will develop an independent post-market surveillance testing program to ensure that blood glucose monitors and strips approved by the FDA continue to meet standards after initial clearance into the U.S. market. They would provide the majority of the heaving lifting for the proposed program: equipment, manpower, testing facilities and labs in the U.S. and abroad. All meters and strips would be purchased by the DTS at points of sale, rather than given by the manufacturers, which have shown to skew testing. There are several issues, however, that need to be addressed before any victory is declared on the accuracy war: funding, enforcement, compliance, clinical and patient education, and the U.S. government. These issues boil down to the understanding that the diabetes community cannot stop voicing our concerns to those who can help: Congress and the FDA. The second set of sessions were dedicated to other medical surveillance programs. We heard about how the National Glycohemoglobin Standardization Program (NGSP) and the College of American Pathologists (CAP) Proficiency Testing Programs – programs already in existence – improve overall quality. HbA1C is just one test to measure how well people with diabetes are doing with their control – but if our meters and strips aren’t accurate, then our HbA1C labs will show that. 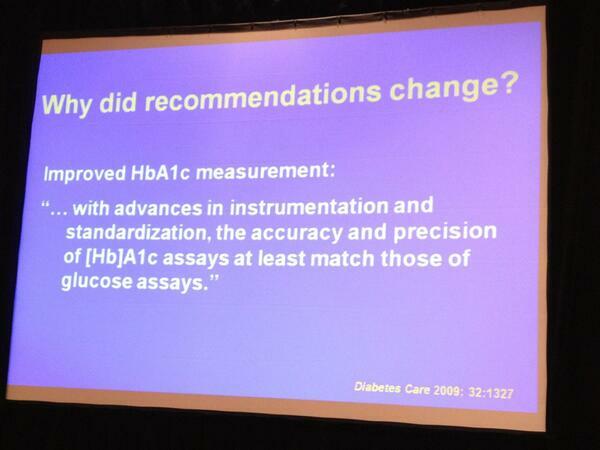 Accurate HbA1C results will mean very little without accurate meters and strips. Of note was an excellent presentation by Dr. Grete Monsen of the Scandinavian Evaluation of Laboratory Equipment for Primary Health Care Bergen, Norway. Since 2006, all meters and strips are required to undergo independent testing through SKUP before they can be marketed and reimbursed. For more information about how SKUP works, visit their website. We see SKUP as being a model of the DTS’s proposed program. The afternoon sessions were the most interesting, as the passion for the proposal and viewpoints from participants shone brightly. Once the president of the DTS, Dr. David Klonoff, MD, presented the concept, the FDA (represented by Dr. Courtney Lias and Katherine Serrano) gave their insights. The concept of “mandatory” testing would not happen without Congress and the process of making it mandatory would take 5 to 6 years through traditional methods. Additional testing would be needed if errors were found and presented to the FDA. The FDA is supporting this effort, as it’s a start in the right direction. However, what they will do with the data has not been fleshed out. During the first afternoon session, diabetes advocates spoke up during the Q&A session, asking the FDA repeatedly about enforcement and removal of faulty meters and strips. When pointedly asked about a warning letter (Edited 9/18/2013 CA) sent to a specific company, the reply was that the FDA could not share what is happening in regards to enforcement and that perhaps they need a better forward-facing PR strategy on this topic. Several advocates spoke of the particular company in further questions until the representative of that company identified himself and offered statements to its defense, but did not elaborate on what enforcement/steps were being taken after two FDA warning letters were issued. The rest of the afternoon was given to two panel discussions: industry views and lab/clinical/advocate views. Bennet Dunlap spoke as a diabetes advocate, giving a compelling plea for accuracy and enforcement. The most reactionary moments came from statements given by Dr. Elizabeth Koller, MD, FACE Lead Medical Officer, Division of Items and Devices, representing CMS and Medicare and the ensuing aftermath. Her prepared statement contradicted the rest of the meeting’s tenor, suggesting that individuals with Type 2 diabetes do not benefit from any possible improvement in glucose meter accuracy, as all existing FDA approved meters currently don’t improve glucose control among type 2 patients who don’t use insulin. The overall reaction from the audience was initially stunned silence at her written statement, which also implied that there should be different meters based on “population” (Type 2 versus Type 1). Panelist Dr. Gary Puckrein, PhD, president and chief executive officer of the National Minority Quality Forum, gave an extemporaneous response, directed at Dr. Koller. He gave his own statistics, explaining that based on actuarial tables, the majority of African-American males aged 65 and over (many of whom have Type 2 diabetes) would be dead. Dr. Koller was surprisingly unemotional in her responses, despite the brouhaha that her statement made in the room. The DTS will set a steering committee over the next few weeks, with representatives from industry, clinic, and advocacy. The issues outlined above as impediments to success of this program will be discussed at further meetings, with timelines created in the near future for the program. This is excellent news! My personal thanks to the Strip Safely team for being the champion of diabetics everywhere.